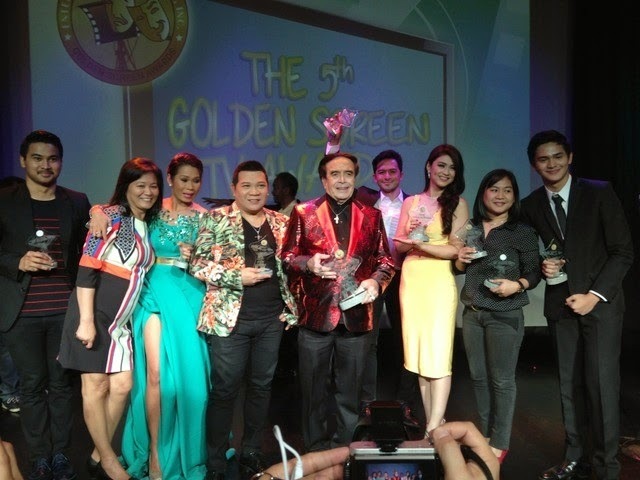 GMA-7 network bagged the most number of awards, having the gay-themed soap opera My Husband's Lover to dominate the drama category of the 5th Golden Screen TV Awards held at Teatrino Promenade in Greenhills, San Juan on March 21, 2014 (Friday). The event was hosted by John Lapus, and co-hosted by Mr. Fu, Bela Padilla, and Atom Araullo. For the special awards, German “Kuya Germs” Moreno received the Gawad Dolphy Lifetime Achievement Award: Ulirang Alagad ng Sining, and Ryzza Mae Dizon received the Special Award as the Youngest TV host on Philippine TV. GMA-7 won the Outstanding TV Network award after winning 28 out of the 50 awards given during the 5th Golden Screen TV Awards. ABS-CBN-2 took home 24 awards, while TV5 bagged two awards.